We had a rather eventful week. In the shortened week gone by, Nifty opened with a gap from 8836 to 8871 on Jan 27th and till Jan 30, 2015, went on to hit an all time high of 8997 ( just 3 short of 9000!) before a huge sell off took hold and crashed the prices to 8775, before it finally closed at 8809.In one day, all the gains made since January 23, were wiped off.In fact this week`s closing of 8809 was lower than the previous week`s closing of 8836. We see a Shooting Star candlestick pattern on the weekly chart and a large bearish engulfing pattern on the daily chart. Both patterns occur after a sustained bull run and on good volumes.This suggests that a trend reversal is possibly on the cards. If this week also the bearish trend continues, we are having a much needed correction.Much needed because, a market which goes up without a correction is far more dangerous. It can collapse like a house of cards hurting a lot of people. Neo wave wise, we are in wave c of abc.Inside wave c, the euphoric rise from 8237 up to 8997 ( 760 points) is wave a and with the sell off, we are possibly in wave b of c.After this wave b, we may possibly have wave c of c which could be the pre budget rally. 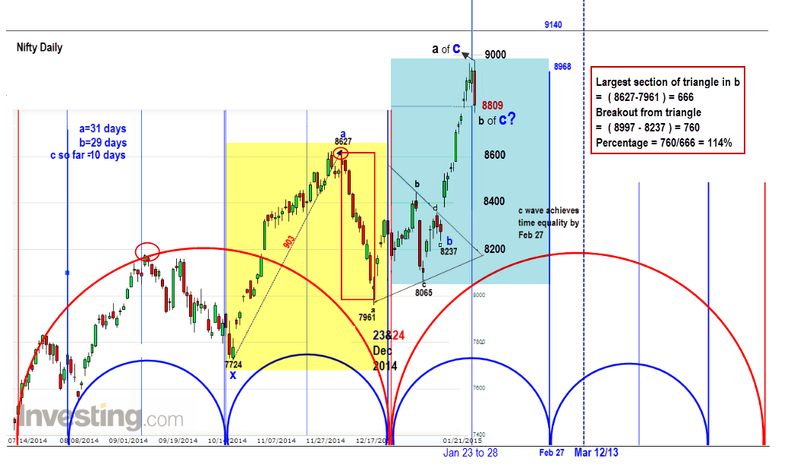 I have updated the cycles chart and shown the current counts on it. Break out from a horizontal, contracting triangle can be upto 125% of the largest leg of the triangle. Largest leg is of a of b, which is 8727-7961=666 points.The current upthrust had made 760 points, which is 114% and of c so the upthrust is technically complete. But wave a and b of the xabc formation, were 31 and 29 day affairs respectively.Wave c has so far done only 10 days.With b of c and c of c remaining, wave c also could do 30 trading days. Whether xabc will end with wave c? This is to be seen because with the recently concluded wave b being smaller than wave a, the chances of a diametric formation is high. This means we may have c up, d down, e up, f down and g up in a butterfly or diamond pattern before the complex correction finally concludes. But this is only an assumption and can be confirmed only after wave c concludes. There is every possibility that abc completes as a zig zag or a flat. Both wave a and this wave a of c were strongly bullish. This agrees with the nature of a zigzag.Critical thing will be the nature of wave b of c ,which is unfolding.This should not be more than 61.8% of wave a of c. But then these are early days yet. Looking at cycles,23 day cycles are the ones depicted in blue. Current uptrend seems to have topped out just after the mid point. See the starting point of this cycle. That was a point where the larger red 108 day cycle and the 23 day cycle bottomed out together.We saw Nifty falling to 7961 from 8727. Now see where the blue cycle ends. It is marked as Feb 27. But the red cycle is soaring when the blue 23 day cycle ends on Feb 27. Bigger cycles tend to influence smaller cycles. So the chances of a distortion to the smaller blue cycle is high. 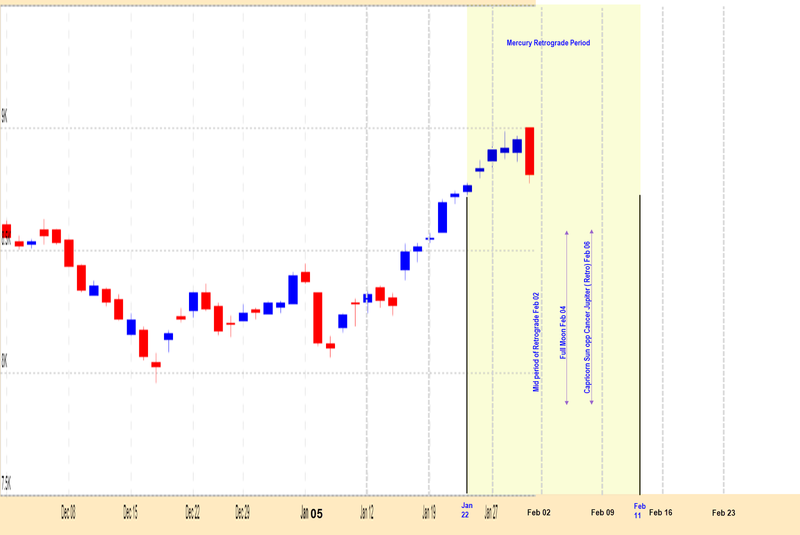 So Nifty may not form a significant low by Feb 27. At best it could be a shallow low. The chart is not as complicated as it looks at first sight! 1. 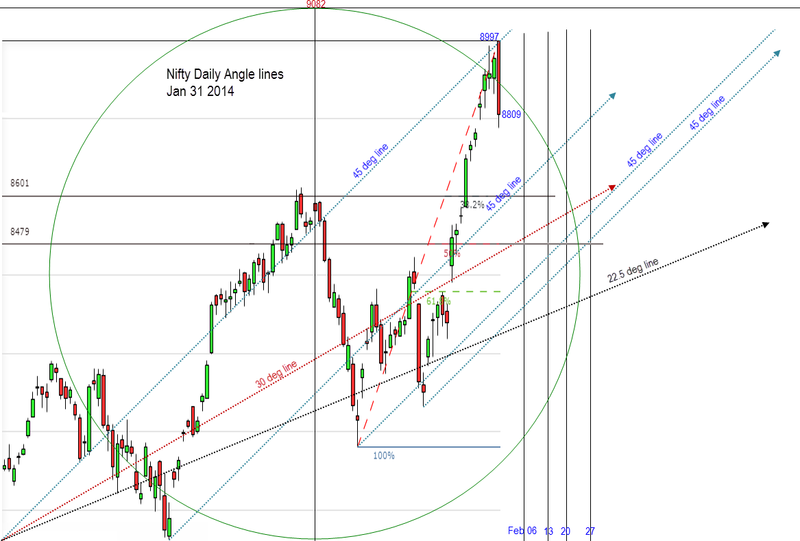 Nifty is bullish enough to reach 9082, based on angle break outs. 2.Nifty follows the 45 degree line faithfully. Every time it slips out, it makes an attempt to reach it. 8997 was one such attempt. Now that it has slipped out of the primary 45 degree line, it should take support at either the secondary 45 deg line or 30 degree line. 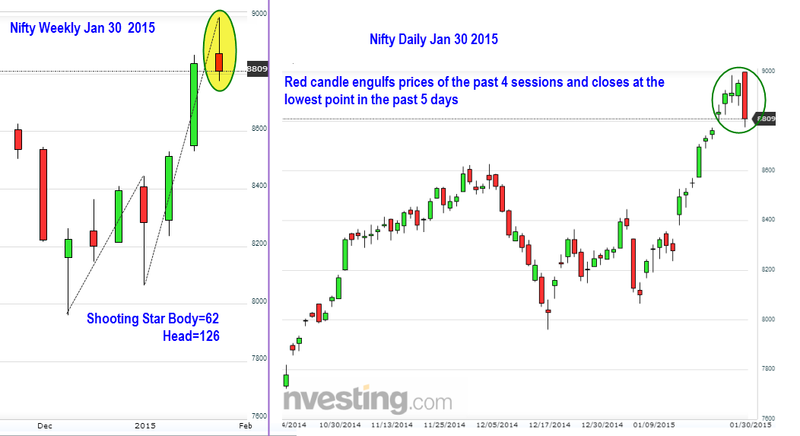 3, Both point to 8601 levels possibly in the second week of February 2015. 4. Wave b of c is also unlikely to go down in a straight line. we may see up and downs. 5. If the fibo levels do not hold, then we may conclude that a diametric is in the offing. Looking at astro formations, we begin the week with Aquarius rising and Moon in Gemini, in the 5th. Jupiter retro is in the 6th ,Venus and Sun are in the 12th.After a weak start markets may bounce back, especially till the Full Moon. Full Moon on 4th February, triggers the Uranus Mars midpoint and gives an effect which is as if Mars is in conjunction to Uranus. Already Uranus and Ketu are inflamed. Since they are in Mercury star,they have been giving sudden, surprising moves in all markets, especially in the currency market.With this translation, Mars also adds its aggression to the equation. Since Pisces represents religious beliefs through Jupiter, terrorism could also escalate, till Jupiter trines with these planets.More volatility and divergences are expected in financial markets. The uptrend which began on January 15th, did not change track on January 22, when Mercury became retrograde, but went on right upto January 30, 2015. We have often seen that if a market does not change direction when Mercury goes retrograde, often does so during the mid period of Mercury retrograde. February 02, 2015 is the tradeable Mercury retro mid period day. And February 11, happens to be the date when Mercury becomes direct. By the weekend, another important aspect will come into play. Capricorn Sun will oppose Cancerian, retro Jupiter.Given its customary orb, we may see a reversal in the period February 11 to 16, 2015. So the question is, considering Mercury phenomenon and Jupiter Sun aspect together, will we see a bottom next week? Friends, I have done my best to put my ideas as clearly as possible here. But Iam not perfect. Neither am I infallible. Please use this information appropriately and trade in such a manner that you do not lose capital. Thanks Suresh for the detailed analysis. Enjoy reading each of your postings. Good learning experience. Dear Shiva, Manoj,Alok, thank you friends for your kind and encouraging comments. Manoj, please see today`s post. Sureshji does the aspects of Moon also play a vital role in the markets?